Natural killer cells are innate effector cells of the immune system, believed to limit viremia and tumor burden before the onset of adaptive T and B cell immunity (1, 2). This task is met by an increase of NK cells in peripheral blood 3–5 days after infection or tumor cell transfer. This NK burst subsides at days 5–7, when adaptive T and B cell responses lead to viral clearance and tumor eradication during successful immune responses. In this review, we want to shed light on this innate and early NK activation. Specifically, we want to address the questions of where NK cells are recruited from, which interactions lead to NK activation, and where this activation takes place. Furthermore, we want to address what role this early NK burst plays during the establishment of immunity and how innate NK activation could be used for immunotherapy. Cytokine-secreting vs cytotoxic NK cells. Although NK cells were initially described as cytotoxic effectors in peripheral blood and were found to lyse tumor cells without prior activation, recent studies suggest that a possibly immunoregulatory subset of NK cells responds to activation mainly with cytokine secretion. Human PBMC contain ∼10% of NK cells (3). The majority (≥95%) belongs to the CD56dimCD16+ cytolytic NK subset (4, 5, 6). These cells carry homing markers for inflamed peripheral sites and carry perforin to rapidly mediate cytotoxicity (4, 5). The minor NK subset in blood (≤5%) is CD56brightCD16− cells (4, 5, 6). These NK cells lack perforin, but secrete large amounts of IFN-γ and TNFβ upon activation and are superior to CD56dim NK cells in these functions (5, 6). In addition, they display homing markers for secondary lymphoid organs, namely CCR7 and CD62L (4). Another difference between these subsets can be found in their receptors mediating target recognition. Human NK recognition of target cells is guided by the balance of activating and inhibitory signals given by different groups of surface receptors. The main activating receptors constitutively found on all NK cells in peripheral blood are NKG2D and the natural cytotoxicity receptors (NCRs)3 NKp30 and NKp46 (7). All of them probably recognize molecules that are up-regulated upon cellular stress (8, 9). However, only the stress-induced NKG2D ligands MHC class I chain-related proteins A/B and UL16 binding proteins (ULBPs) have so far been identified (10, 11). Whereas cytotoxic peripheral blood CD56dim NK cells are able to target Ab-opsonized cells via their low-affinity FcγRIII/CD16 molecule, immunoregulatory CD56bright NK cells lack this receptor nearly entirely (4). Most inhibitory NK receptors engage MHC class I molecules on target cells (12). They can be distinguished into two groups, detecting either common allelic determinants of MHC class I, or MHC class I expression in general. The killer inhibitory receptors (KIRs) constituting the first group distinguish polymorphic HLA-B and -C molecules. The inhibitory receptors surveying MHC class I expression in general are more heterogeneous. They include the leukocyte Ig-like receptor 1/Ig-like transcript 2 molecule with a broad specificity for different HLA class I molecules and the CD94/NKG2A heterodimer, specific for HLA-E whose surface expression is dictated by the availability of HLA class I H chain signal peptides. The MHC class I allele-specific KIRs are expressed on subsets of CD56dimCD16+ cytolytic NK cells, whereas the immunoregulatory CD56brightCD16− NK subset expresses uniformly CD94/NKG2A and lacks KIRs (5). These phenotypes are consistent with the hypothesis that CD56dimCD16+ NK cells are terminally differentiated effectors that carry the whole panel of sophisticated activating and inhibitory receptors to even detect allelic HLA loss and can readily lyse malignant cells at peripheral inflammation sites. On the contrary, CD56brightCD16− NK cells might perform an immunoregulatory function in secondary lymphoid tissues. NK cells in blood and secondary lymphoid organs. Peripheral blood is the most accessible source of human NK cells. Therefore, most studies have been performed with NK populations from this organ and it was assumed that most NK cells circulate in human blood after their emigration from the bone marrow. Recently, however, we and others have shown that a substantial amount of human NK cells homes to secondary lymphoid organs. These amount to ∼5% of mononuclear cells in uninflamed lymph nodes and 0.4–1% in inflamed tonsils and lymph nodes (13 ,85). These NK cells constitute a remarkable pool of innate effector cells, because lymph nodes harbor 40% of all lymphocytes, whereas peripheral blood contains only 2% of all lymphocytes (14, 15). Therefore, lymph node NK cells are, in the absence of infection and inflammation, 10 times more abundant than blood NK cells. As expected from CCR7 and CD62L expression on CD56bright NK cells in blood, the CD56bright NK subset is enriched in all secondary lymphoid organs analyzed so far (lymph nodes, tonsils, and spleen) (85). In spleen, ∼15%, and in tonsils and lymph nodes, ∼75% of NK cells belong to the CD56bright subset. Lymph node and tonsil NK cells, however, uniformly lack FcγRIII/CD16 and KIRs, whereas the CD56dim NK cells in spleen express these molecules (85). Surprisingly, and in contrast to CD56bright blood NK cells, lymph node and tonsil NK cells show no or very low expression of the constitutive NCRs NKp30 and NKp46 (13 ,85). The inducible NCR NKp44 is up-regulated on NK cells of inflamed tonsils (85). Therefore, target cell recognition by lymph node and tonsil NK cells seems to be mainly influenced by NKG2D as activating and CD94/NKG2A as inhibitory receptor (13 ,85). This NK receptor repertoire of lymph node and tonsil NK cells is similar to CD56bright blood NK cells, but even more restricted by the absence of constitutive NCRs (Table I⇓). With respect to NK function, secondary lymphoid tissue NK cells show an impressive plasticity. Although lymph node and tonsil NK cells are initially perforin negative and show no cytolytic activity against MHC class I-low and ULBPhigh targets, perforin and cytotoxicity can be up-regulated by IL-2 within 3–7 days (85). Interestingly, NK cells from secondary lymphoid organs gain during the same time period expression of CD16, NCRs NKp30, NKp46, and NKp44, as well as KIRs (85). Therefore, activation converts lymph node and tonsil NK cells into effectors, similar to the terminally differentiated CD56dimCD16+ blood NK cells with cytolytic function and the sophisticated set of inhibitory and activating receptors. Cytokines in DC-mediated NK activation. The above-mentioned human NK compartments are probably all involved in early innate immune responses to viruses and tumors. Immune responses are started by APCs, which sense pathogens directly or sense cellular stress, leading to the release of inflammatory cytokines and stress-induced cellular proteins. Recently, one particular APC, the DC, has been implicated in the activation of NK cells in both mouse and man (16, 17, 18, 19, 20, 21, 22). During NK activation by DCs, both soluble factors as well as cell-to-cell contact seem to be important. In mice, induction of NK cytotoxicity was entirely blocked by Transwell separation of DCs and NK cells, indicative for a major contribution of DC surface receptors in NK activation (16). In addition, DC-derived IFN-αβ, IL-12, and IL-18 have been reported to be crucial in murine NK activation (23, 24, 25). Although IL-12 was mainly implicated in NK-mediated IFN-γ secretion, IFN-αβ seems to be required for cytotoxicity of NK cells (25, 26). In addition, secretion of IL-2 by DCs stimulated with microbial stimuli might also contribute to NK activation (27, 28). In humans, NK activation by DCs was not significantly disrupted by Transwell separation of the two cell types, indicating a major contribution of soluble factors in NK activation (21, 22). In one study, DCs were unable to activate NK cells in the presence of neutralizing Abs for IL-12 and IL-18 (22). We have found that NK activation by DC subsets correlates with IL-12 secretion by these DCs, whereas IL-15 and IL-18 secretion were not indicative for NK activation (C. Münz, T. Dao, G. Ferlazzo, and J. W. Young, unpublished data). Therefore, IL-12 might play an important role in human NK activation by DCs. Surface receptors in NK/DC cross talk. While cytokines play a dominant role in human NK activation by DCs, IFN-α treatment of DCs additionally up-regulates the NKG2D ligands, MHC class I chain-related proteins A/B on moncyte-derived DCs and these molecules seem to activate resting NK cells in a cell-contact-dependent manner (86). Up-regulation of MHC class I chain-related proteins A/B on DCs upon IFN-α exposure seems to be mediated by DC-derived autocrine/paracrine IL-15 (87). Therefore, cell contact might contribute to NK activation by human DCs under certain inflammatory conditions. While a broader role of surface molecules for NK activation by DCs remains to be established, activated NK cells have been shown to recognize and lyse DCs in vitro (17, 20, 29, 30, 31) and probably also in vivo (32). Upon maturation of DCs by microbial stimuli, proinflammatory cytokines, or CD40 ligand, DCs become resistant to NK lysis (17, 29, 30, 33). MHC class I up-regulation during maturation protects DCs from NK lysis (17, 33). Mainly, the increase in surface expression of the nonclassical MHC class Ib molecule HLA-E during maturation seems to confer resistance to NK lysis (30, 34). While MHC class I-specific NK receptors mediate inhibition of DC lysis by NK cells, the adhesion molecule LFA-1 (35) and the activating NK receptor NCR NKp30 (17) stimulate NK cells for lysis of DCs. NKp30 also recognizes mature DCs and leads to NK lysis after Ab blocking of MHC class I molecules (17). Therefore, activated NK cells might efficiently remove immature/nonactivated DCs from inflamed tissues. Encounter at sites of inflammation. The recent data on NK activation by DCs suggest that these APCs initiate the early and innate NK activation against viruses and tumors. The question remains where this interaction takes place. One site of DC/NK interaction is inflamed tissue. NK cells have been found in close contact with DCs in lesions of allergen-induced atopic eczema/dermatitis syndrome (36). Moreover, the chemokine receptor repertoire and the chemokine responsiveness of CD56dimCD16+ blood NK cells suggest that they can home to sites of inflammation efficiently (4). The cytotoxic blood NK subset migrates efficiently in response to IL-8 and soluble fractalkine and expresses the respective receptors for these chemokines, CXCR1 and CX3CR1. Both chemokines are induced by proinflammatory cytokines like IL-1 and TNF-α (37, 38). Fractalkine mediates adhesion to endothelia and emigration of NK cells from the blood stream, whereas IL-8 mediates further migration to the site of inflammation (39). Therefore, cytotoxic CD56dimCD16+ blood NK cells are able to home to inflamed tissues where they can encounter DCs, which are resident in peripheral tissue sites. The DC/NK encounter at sites of inflammation can either result in DC maturation by modest NK infiltration or in immature DC lysis due to large NK cell infiltrates (20). The maturation of DCs upon NK encounter has been largely attributed to TNF-α secretion by NK cells (18, 20). Both NK effector mechanisms will deplete the inflamed tissue of DCs either by maturation-induced migration or by killing. This will deprive DC trophic pathogens of their host cells at the site of infection. Activation and maturation of NK cells in secondary lymphoid organs. Until recently, only limited information has been available on NK cells located in lymphoid tissues, and therefore, NK cells have mainly been considered as effector cells harbored in the bloodstream and able to promptly extravasate to inflamed tissues. The evidence that a large amount of NK cells is located in uninflamed lymph nodes (85) suggests secondary lymphoid organs as important sites of NK cell activation. Indeed, CD56brightCD16− NK cells isolated from uninflamed human lymph nodes become strongly cytolytic upon stimulation with IL-2. The de novo-acquired cytotoxic properties were accompanied by the expression of both activating and inhibitory receptors. Therefore, it is tempting to speculate that NK cells resident in secondary lymphoid tissues might represent an immature pool of effector cells that can acquire cytolytic potential early during immune responses. In addition, perforin-negative NK cells located in secondary lymphoid organs might play different roles before maturation into cytolytic effectors, such as secretion of critical immunoregulatory cytokines upon activation. In this regard, it has been demonstrated that peripheral blood CD56brightCD16− NK cells produce significantly higher levels of cytokines than their CD56dimCD16+ counterpart (6, 40). Similarly, the CD56brightCD16− NK subset located in secondary lymphoid organs produces relevant cytokines before maturation into cytolytic effector cells. We could indeed show that tonsillar NK cells produce IFN-γ within 24 h after IL-2 and IL-12 stimulation or a combination of these cytokines (85). Based on these findings, NK cells in secondary lymphoid organs should not be referred to as a merely immature NK cells but rather as effector cells whose functional plasticity enables them to accomplish different sequential tasks during immune responses. Interestingly, several reports have recently shown that DCs elicit IFN-γ secretion by autologous peripheral blood NK cells (16, 17, 18, 20). In addition, CD56brightCD16− NK cells produce significantly higher levels of IFN-γ, TNFβ, GM-CSF, IL-10, and IL-13 protein in response to monokines produced by DCs, such as IL-12, IL-15, IL-18, and IL-1β (6). Because DCs migrate to secondary lymphoid tissues upon activation, they might encounter CD56brightCD16− NK cells there in the very early phase of an immune response before T cell activation. This could result in local cytokine release by NK cells, which might be able to shape the following adaptive immune response and probably also APC functions (41). NK responses in herpesvirus immune responses. NK cell responses during herpesvirus infections have been studied in mouse and man. In humans, transitory NK deficiency leads to abnormal sensitivity to herpesvirus infections (42), and NK cells seem to counteract gammaherpesvirus, namely EBV transformation in vitro (43, 44, 45) as well as in vivo (46). A similar NK requirement has been established in murine betaherpesvirus, namely murine CMV (MCMV) infections (2). NK-deficient beige mice are more susceptible to MCMV infection (47), and Ly49H-carrying NK cells mediate resistance to MCMV (48, 49, 50). During MCMV infection, NK cells seem to contain infected hepatocytes until they can be cleared by T cells (51). NK infiltration of MCMV-infected liver seems to occur in response to macrophage-inflammatory protein-1α/CCL3 production (52) and mediates its protective effect by IFN-γ secretion (53). In humans, human CMV was also reported to induce IL-8 production (54, 55, 56, 57). Therefore, both macrophage-inflammatory protein-1α/CCL3 and IL-8 might play a role in targeting NK cells to MCMV-infected hepatocytes. The NK population carrying the respective chemokine receptors, CCR5 and CXCR3, for this chemokine combination are noncytolytic CD56brightCD16− cells (4). They might mediate CMV containment by secreting large amounts of IFN-γ (6). Surface markers that trigger NK response to virus-infected or tumor cells. The well-established existence of mechanisms for NK cell inactivation to prevent undesired tissue damage implies the existence of a ubiquitous “on” signal for NK cell activation. The surface receptors responsible for NK cell triggering during natural cytotoxicity have been characterized at a molecular level, and some light has now been shed on the general mechanisms that allow NK cells to spare normal, but kill transformed or virus-infected cells (7). The killer activating receptors, which are specific for MHC class I molecules, are highly homologous to the corresponding KIRs and have been identified on subsets of NK cells (58, 59, 60). Because they are, however, always expressed with their dominant-negative counterpart receptors, they probably cannot function in NK lysis of MHC class I-deficient target cells. Therefore, the major receptors involved in NK cell triggering in the process of natural cytotoxicity are NKp30, NKp46, NKp44, and NKG2D. The NCRs NKp30, NKp46, and NKp44, are members of the Ig superfamily and play a major role in the lysis of some B cell lymphoma cells lines and some EBV-transformed B cell lines (61). NCRs have so far been found only on NK cells (7, 62). The NCRs NKp46 and NKp30 are present on all NK cells in peripheral blood, whereas they are absent or only weakly expressed on NK cells of secondary lymphoid tissues (85). The NCR NKp44 is expressed by in vitro-activated NK cells (63), and it has also been detected on NK cells directly isolated from inflamed palatine tonsils (85). The ligands of NCR have not yet been identified, but recent studies in allogenic, mismatched hemopoietic transplantation (32) would suggest that NCR ligands should not be expressed on normal tissues, but could be stress-induced (8, 9). Apart from NCRs, the activating NK receptor NKG2D plays a major role in NK-mediated cytotoxicity against tumors and virus-infected cells (64, 65). NKG2D is a C-type lectin-like molecule present in NK and CTLs and recognizes the ligands MHC class I chain-related proteins A and B as well as ULBPs 1–3 in humans, and H6O, murine ULBP-like transcript 1, and retinoic acid early inducible 1α-ε in mice. Like NCR ligands, the NKG2D ligands are thought to be expressed upon cellular stress, but the exact mechanisms remain unclear. NKG2D ligands are up-regulated on epithelial tumors (66, 67), leukemias (68, 69), and some melanoma as well as T cell lymphoma cell lines (61). In addition, the NKG2D ligands can be induced by viral and bacterial infections (70, 71). Different from NCRs, NKG2D is homogeneously expressed by NK cells in human lymph nodes. This is of relevance, because draining lymph nodes are usually the first metastatic sites of spreading cancers, and NK cells might counteract metastases at these sites. In a mouse model, the ectopic expression of NKG2D ligands on tumor cells led to the rejection of the tumors. In addition, mice that have been challenged with ligand-expressing tumors develop T cell immunity against parental tumor cells not expressing NKG2D ligands (72). Apart from these main receptors in natural cytotoxicity, the activating coreceptor 2B4 has been implicated in resistance to B cell transformation by EBV. In the hereditary disorder X-linked lymphoproliferative disease, young males succumb to B cell lymphomas after primary EBV infection (73). The genetic defect converts activating 2B4 signaling to inhibitory and therefore renders NK cells inactive against EBV-transformed B cells (74). The B cell ligand for 2B4 is CD48 (75, 76), a molecule widely expressed on human leukocytes. Together, these recent studies imply that ligands for activating NK receptors can be induced by infection or transformation on B cells, T cells, epithelial cells, and melanocytes. In addition, inhibitory NK receptors, surveying self MHC class I expression, safeguard NK cytolysis against cells marked for destruction by activating NK receptor ligands. Role for NK cells in DC editing. NK cells are highly effective in targeting cells that have down-regulated HLA class I molecules and up-regulated ligands for activating NK receptors due to viral infection or neoplastic transformation. On the contrary, normal autologous cells are usually spared by NK-mediated lysis, but an important exception to this rule are immature DCs. NK cells have been shown to efficiently target autologous immature DCs, while in turn DCs induce NK activation, thus further potentiating NK function against infected or cancer cells, but also against DCs themselves (17, 20, 29). Although it could seem paradoxical that, in the course of the immune response, NK cells should deplete such a critical player of the immune response, a possible explanation could be that autologous NK cells remove DCs, only when DCs are in their less-immunogenic immature stage of differentiation. They promptly acquire resistance to NK lysis upon maturation by proinflammatory cytokines, or microbial or T cell-derived stimuli. Resistance to NK lysis is achieved by up-regulation of MHC class I molecules during DC maturation (33), in particular up-regulation of HLA-E (34). Interestingly, the inhibitory NK receptor CD94/NKG2A, which monitors HLA-E levels, is the only inhibitory NK receptor found so far on NK cells of secondary lymphoid organs (85). Therefore, NK cells are able to discriminate between the immature and mature DCs via HLA-E. Whereas immature DCs have been implicated in tolerance and regulatory T cell induction, mature DCs are thought to be the main APCs in immunity initiation (77, 78). Thus, NK cells might play an important regulatory role by selectively editing APCs during the course of immune responses. NK-mediated lysis of immature, but not mature DCs might select an immunogenic DC population during the initiation of immune responses. In addition to removal of nonimmunogenic DCs, NK cells also secrete IFN-γ upon encounter of DCs (17). As a consequence, subsequent T cell polarization may be influenced, because in vitro studies in both mouse and human systems have established the importance of IFN-γ in the polarization of type 1 immune responses (79, 80). Interestingly, in a murine model of skin graft rejection, the recognition of donor DCs by host NK cells led to modulation of Th1/Th2 cell development. Namely, turning host NK cells off was sufficient to skew the alloresponse to Th2 (81). In conclusion, early activation of NK cells by DCs may play an immunoregulatory role in shaping the emerging adaptive immune responses. The ability to edit APCs as well as secrete immunomodulatory cytokines might result in increased and predominantly Th1 polarized immune responses. NK cell therapy in leukemia treatment. Recent clinical data have suggested the possibility of exploiting NK/DC cross talk in the treatment of acute myeloid leukemia (AML). The polymorphic KIRs recognize shared allelic determinants of polymorphic HLA class Ia molecules, mainly HLA-B and -C (76). Differences in their expression between individuals are the basis for NK recognition of allogenic cells in humans. In the clinical setting, NK allorecognition might take place in patients undergoing haploidentical bone marrow transplantation, in which donor and recipient are identical for one HLA haplotype and incompatible at the HLA loci of the unshared haplotype. Recently, reports have provided evidence that HLA mismatch between donor and recipient, affecting KIR recognition and therefore provoking donor NK alloreactivity, could have important clinical benefits in the treatment of AML via bone marrow transplantation (32, 82). According to these studies, not only leukemic relapses, but also host-vs-graft and graft-vs-host reactions (the latter representing a life-threatening complication of haploidentical bone marrow transplantation) are significantly decreased in the presence of KIR/HLA mismatch. As a consequence, patients treated for AML with haploidentical, KIR/HLA-mismatched bone marrow transplantation showed a 60% survival rate at 5 years (vs 5% in the absence of KIR/HLA mismatch). Both in vivo (32) and in vitro (17, 20, 29) experimental data support the notion that these improved clinical outcomes reside not only in a more effective elimination of leukemia cells by allogenic NK cells, but also by the preferential killing of recipient DCs. These are known to be responsible for priming donor T cells and to induce graft-vs-host disease (GvHD). Instead of relying on the recruitment of NK cells from partially HLA-mismatched bone marrow, the infusion of alloreactive NK cells and thus depletion of recipient DCs could effectively interfere with the occurrence of GvHD. The interaction of NK cells with allogenic DCs would further activate NK reactivity against leukemia cells. Indeed, in a murine model, it has already been demonstrated that alloreactive NK cells are able to significantly decrease the amount of DCs present in bone marrow, spleen, and gut, and that elimination of these DCs correlated with the protective effect against GvHD (32). Normal tissue was not damaged during this alloreactive NK cell therapy. The infusion of KIR/HLA-mismatched NK cells could therefore be foreseen as a safe form of adoptive cellular immunotherapy that should be considered in the treatment of AML leukemia or other malignancies. Lessons learned from IL-2 therapy. Recombinant IL-2 has been used as an immunostimulant in cancer patients, and different doses have been tested to assess therapeutic effectiveness and safety, either as i.v. infusion or s.c. administration. Interestingly, continuous i.v. infusion of low-dose rIL-2 therapy results in an increase of CD56brightCD16+ NK cells in the peripheral blood, amounting to up to 70% of lymphocytes after 12 wk of treatment (83). A further study demonstrated that these NK cells are not cycling and therefore are probably mobilized from extravascular tissues (84). These NK cells might be recruited from secondary lymphoid tissues, which contain an abundant NK reservoir (13 ,85). Consistent with this hypothesis, CD56brightCD16− NK cells from lymph nodes acquire CD16 and cytolytic function upon culture in the presence of IL-2 (85). In addition, CD56brightCD16− NK cells of secondary lymphoid organs differ from the respective NK cell subset in peripheral blood by lack of CCR7 and CD62L surface expression. Therefore, they are not anchored by the respective chemokines and adhesion molecules in secondary lymphoid tissues. Because in uninflamed tissues, lymph node NK cells outnumber peripheral blood NK cells by ∼10:1 (14 ,15 ,85), this NK compartment could be targeted by immunotherapy aimed to enhance natural cytotoxicity against tumors and viruses. Because DCs are potent activators of NK cells, the mobilization of lymph node NK cells during DC-based immunotherapy should be investigated. In summary, immunomodulatory as well as cytotoxic NK cells can be activated via DCs early during immune responses and, thus, might be exploited for immunotherapies against tumors and viruses. Possible interaction sites for this encounter are sites of inflammation and secondary lymphoid tissues (Fig. 1⇓). DC-activated NK cells might then exert effector functions against infected and/or transformed cells, but also influence the emerging adaptive immune response via APC editing and immunomodulatory cytokine secretion. Inflamed tissues and secondary lymphoid organs are possible sites of DC/NK interaction. Upon infection, NK cells get recruited from peripheral blood to inflamed tissues (1). Cytolytic, perforin+CD56dim NK cells, which constitute the majority of peripheral blood NK cells, carry the necessary chemokine receptors to home to inflamed tissues. They can interact with DCs at these sites and edit DCs before these cells mature and migrate to secondary lymphoid tissues. In secondary lymphoid tissues like lymph nodes, DCs can interact with immunomodulatory CD56bright NK cells (2), which constitute the majority of NK cells in lymph nodes and tonsils. Both DC editing and the release of immunomodulatory cytokines like IFN-γ by NK cells at both interaction sites might influence the magnitude and polarization of the DC-initiated adaptive immune response. ↵1 This work was funded by a Special Fellowship from the Leukemia and Lymphoma Society, and by a grant from the Speaker’s Fund for Public Health Research, awarded by the City of New York to C.M. ; and by grants from Associazione Italiana per la Ricerca sul Cancro and from Ministero della Salute, Italy, to G.F.
↵3 Abbreviations used in this paper: NCR, natural cytotoxicity receptor; ULBP, UL16 binding protein; KIR, killer inhibitory receptor; DC, dendritic cell; MCMV, murine CMV; AML, acute myeloid leukemia; GvHD, graft-vs-host disease. Robertson, M. J., J. Ritz. 1990. Biology and clinical relevance of human natural killer cells. Blood 76:2421. Campbell, J. J., S. Qin, D. Unutmaz, D. Soler, K. E. Murphy, M. R. Hodge, L. Wu, E. C. Butcher. 2001. Unique subpopulations of CD56+ NK and NK-T peripheral blood lymphocytes identified by chemokine receptor expression repertoire. J. Immunol. 166:6477. Jacobs, R., G. Hintzen, A. Kemper, K. Beul, S. Kempf, G. Behrens, K. W. Sykora, R. E. Schmidt. 2001. CD56bright cells differ in their KIR repertoire and cytotoxic features from CD56dim NK cells. Eur. J. Immunol. 31:3121.
Cooper, M. A., T. A. Fehniger, S. C. Turner, K. S. Chen, B. A. Ghaheri, T. Ghayur, W. E. Carson, M. A. Caligiuri. 2001. Human natural killer cells: a unique innate immunoregulatory role for the CD56bright subset. Blood 97:3146. Moretta, L., G. Ferlazzo, M. C. Mingari, G. Melioli, A. Moretta. 2003. Human natural killer cell function and their interactions with dendritic cells. Vaccine 21:(Suppl. 2):S38. Moretta, L., C. Bottino, D. Pende, M. C. Mingari, R. Biassoni, A. Moretta. 2002. Human natural killer cells: their origin, receptors and function. Eur. J. Immunol. 32:1205. Bauer, S., V. Groh, J. Wu, A. Steinle, J. H. Phillips, L. L. Lanier, T. Spies. 1999. Activation of NK cells and T cells by NKG2D, a receptor for stress- inducible MICA. Science 285:727. Fehniger, T. A., M. A. Cooper, G. J. Nuovo, M. Cella, F. Facchetti, M. Colonna, M. A. Caligiuri. 2003. 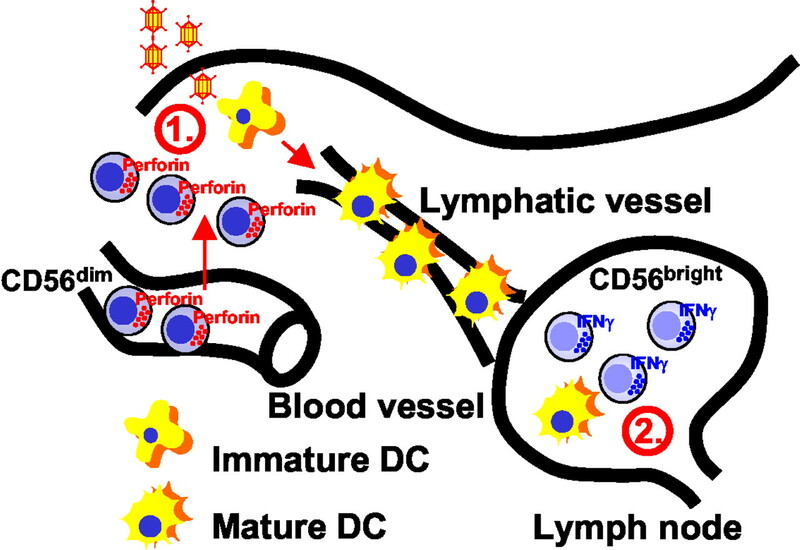 CD56bright natural killer cells are present in human lymph nodes and are activated by T cell-derived IL-2: a potential new link between adaptive and innate immunity. Blood 101:3052. Westermann, J., R. Pabst. 1992. Distribution of lymphocyte subsets and natural killer cells in the human body. Clin. Invest. 70:539. Trepel, F.. 1974. Number and distribution of lymphocytes in man: a critical analysis. Klin. Wochenschr. 52:511. Ferlazzo, G., M. L. Tsang, L. Moretta, G. Melioli, R. M. Steinman, C. Münz. 2002. Human dendritic cells activate resting NK cells and are recognized via the NKp30 receptor by activated NK cells. J. Exp. Med. 195:343. Ferlazzo, G., B. Morandi, A. D’Agostino, R. Meazza, G. Melioli, A. Moretta, L. Moretta. 2003. The interaction between NK cells and dendritic cells in bacterial infections results in rapid induction of NK cell activation and in the lysis of uninfected dendritic cells. Eur. J. Immunol. 33:306. Yu, Y., M. Hagihara, K. Ando, B. Gansuvd, H. Matsuzawa, T. Tsuchiya, Y. Ueda, H. Inoue, T. Hotta, S. Kato. 2001. Enhancement of human cord blood CD34+ cell-derived NK cell cytotoxicity by dendritic cells. J. Immunol. 166:1590. Andrews, D. M., A. A. Scalzo, W. M. Yokoyama, M. J. Smyth, M. A. Degli-Esposti. 2003. Functional interactions between dendritic cells and NK cells during viral infection. Nat. Immunol. 4:175. Orange, J. S., C. A. Biron. 1996. An absolute and restricted requirement for IL-12 in natural killer cell IFN-γ production and antiviral defense: studies of natural killer and T cell responses in contrasting viral infections. J. Immunol. 156:1138. Dalod, M., T. Hamilton, R. Salomon, T. P. Salazar-Mather, S. C. Henry, J. D. Hamilton, C. A. Biron. 2003. Dendritic cell responses to early murine cytomegalovirus infection: subset functional specialization and differential regulation by interferon α/β. J. Exp. Med. 197:885. Granucci, F., C. Vizzardelli, N. Pavelka, S. Feau, M. Persico, E. Virzi, M. Rescigno, G. Moro, P. Ricciardi-Castagnoli. 2001. Inducible IL-2 production by dendritic cells revealed by global gene expression analysis. Nat. Immunol. 2:882. Granucci, F., S. Feau, V. Angeli, F. Trottein, P. Ricciardi-Castagnoli. 2003. Early IL-2 production by mouse dendritic cells is the result of microbial-induced priming. J. Immunol. 170:5075. Spaggiari, G. M., R. Carosio, D. Pende, S. Marcenaro, P. Rivera, M. R. Zocchi, L. Moretta, A. Poggi. 2001. NK cell-mediated lysis of autologous antigen-presenting cells is triggered by the engagement of the phosphatidylinositol 3-kinase upon ligation of the natural cytotoxicity receptors NKp30 and NKp46. Eur. J. Immunol. 31:1656. Ruggeri, L., M. Capanni, E. Urbani, K. Perruccio, W. D. Shlomchik, A. Tosti, S. Posati, D. Rogaia, F. Frassoni, F. Aversa, et al 2002. Effectiveness of donor natural killer cell alloreactivity in mismatched hematopoietic transplants. Science 295:2097. Ferlazzo, G., C. Semino, G. Melioli. 2001. HLA class I molecule expression is up-regulated during maturation of dendritic cells, protecting them from natural killer cell-mediated lysis. Immunol. Lett. 76:37. Della Chiesa, M., M. Vitale, S. Carlomagno, G. Ferlazzo, L. Moretta, A. Moretta. 2003. The natural killer cell-mediated killing of autologous dendritic cells is confined to a cell subset expressing CD94/NKG2A, but lacking inhibitory killer Ig-like receptors. Eur. J. Immunol. 33:1657. Poggi, A., R. Carosio, G. M. Spaggiari, C. Fortis, G. Tambussi, G. Dell’Antonio, E. Dal Cin, A. Rubartelli, M. R. Zocchi. 2002. NK cell activation by dendritic cells is dependent on LFA-1-mediated induction of calcium-calmodulin kinase II: inhibition by HIV-1 Tat C-terminal domain. J. Immunol. 168:95. Buentke, E., L. C. Heffler, J. L. Wilson, R. P. Wallin, C. Lofman, B. J. Chambers, H. G. Ljunggren, A. Scheynius. 2002. Natural killer and dendritic cell contact in lesional atopic dermatitis skin-Malassezia-influenced cell interaction. J. Invest. Dermatol. 119:850. Bazan, J. F., K. B. Bacon, G. Hardiman, W. Wang, K. Soo, D. Rossi, D. R. Greaves, A. Zlotnik, T. J. Schall. 1997. A new class of membrane-bound chemokine with a CX3C motif. Nature 385:640. Hoffmann, E., O. Dittrich-Breiholz, H. Holtmann, M. Kracht. 2002. Multiple control of interleukin-8 gene expression. J. Leukocyte Biol. 72:847. Nishimura, M., H. Umehara, T. Nakayama, O. Yoneda, K. Hieshima, M. Kakizaki, N. Dohmae, O. Yoshie, T. Imai. 2002. Dual functions of fractalkine/CX3C ligand 1 in trafficking of perforin+/granzyme B+ cytotoxic effector lymphocytes that are defined by CX3CR1 expression. J. Immunol. 168:6173.
Cooper, M. A., T. A. Fehniger, M. A. Caligiuri. 2001. The biology of human natural killer-cell subsets. Trends Immunol. 22:633. Dowdell, K. C., D. J. Cua, E. Kirkman, S. A. Stohlman. 2003. NK cells regulate CD4 responses prior to antigen encounter. J. Immunol. 171:234. Wilson, A. D., A. J. Morgan. 2002. Primary immune responses by cord blood CD4+ T cells and NK cells inhibit Epstein-Barr virus B-cell transformation in vitro. J. Virol. 76:5071. Masucci, M. G., M. T. Bejarano, G. Masucci, E. Klein. 1983. Large granular lymphocytes inhibit the in vitro growth of autologous Epstein-Barr virus-infected B cells. Cell. Immunol. 76:311. Thorley-Lawson, D. A., L. Chess, J. L. Strominger. 1977. Suppression of in vitro Epstein-Barr virus infection: a new role for adult human T lymphocytes. J. Exp. Med. 146:495. Baiocchi, R. A., J. S. Ward, L. Carrodeguas, C. F. Eisenbeis, R. Peng, S. Roychowdhury, S. Vourganti, T. Sekula, M. O’Brien, M. Moeschberger, M. A. Caligiuri. 2001. GM-CSF and IL-2 induce specific cellular immunity and provide protection against Epstein-Barr virus lymphoproliferative disorder. J. Clin. Invest. 108:887. Shellam, G. R., J. E. Allan, J. M. Papadimitriou, G. J. Bancroft. 1981. Increased susceptibility to cytomegalovirus infection in beige mutant mice. Proc. Natl. Acad. Sci. USA 78:5104. Brown, M. G., A. O. Dokun, J. W. Heusel, H. R. Smith, D. L. Beckman, E. A. Blattenberger, C. E. Dubbelde, L. R. Stone, A. A. Scalzo, W. M. Yokoyama. 2001. Vital involvement of a natural killer cell activation receptor in resistance to viral infection. Science 292:934. Daniels, K. A., G. Devora, W. C. Lai, C. L. O’Donnell, M. Bennett, R. M. Welsh. 2001. Murine cytomegalovirus is regulated by a discrete subset of natural killer cells reactive with monoclonal antibody to Ly49H. J. Exp. Med. 194:29. Lee, S. H., S. Girard, D. Macina, M. Busa, A. Zafer, A. Belouchi, P. Gros, S. M. Vidal. 2001. Susceptibility to mouse cytomegalovirus is associated with deletion of an activating natural killer cell receptor of the C-type lectin superfamily. Nat. Genet. 28:42. Salazar-Mather, T. P., J. S. Orange, C. A. Biron. 1998. Early murine cytomegalovirus (MCMV) infection induces liver natural killer (NK) cell inflammation and protection through macrophage inflammatory protein 1α (MIP-1α)-dependent pathways. J. Exp. Med. 187:1. Salazar-Mather, T. P., C. A. Lewis, C. A. Biron. 2002. Type I interferons regulate inflammatory cell trafficking and macrophage inflammatory protein 1α delivery to the liver. J. Clin. Invest. 110:321. Salazar-Mather, T. P., T. A. Hamilton, C. A. Biron. 2000. A chemokine-to-cytokine-to-chemokine cascade critical in antiviral defense. J. Clin. Invest. 105:985. Craigen, J. L., J. E. Grundy. 1996. Cytomegalovirus induced up-regulation of LFA-3 (CD58) and ICAM-1 (CD54) is a direct viral effect that is not prevented by ganciclovir or foscarnet treatment. Transplantation 62:1102. Craigen, J. L., K. L. Yong, N. J. Jordan, L. P. MacCormac, J. Westwick, A. N. Akbar, J. E. Grundy. 1997. Human cytomegalovirus infection up-regulates interleukin-8 gene expression and stimulates neutrophil transendothelial migration. Immunology 92:138. Almeida-Porada, G., C. D. Porada, J. D. Shanley, J. L. Ascensao. 1997. Altered production of GM-CSF and IL-8 in cytomegalovirus-infected, IL-1-primed umbilical cord endothelial cells. Exp. Hematol. 25:1278. Murayama, T., Y. Ohara, M. Obuchi, K. S. Khabar, H. Higashi, N. Mukaida, K. Matsushima. 1997. Human cytomegalovirus induces interleukin-8 production by a human monocytic cell line, THP-1, through acting concurrently on AP-1- and NF-κB-binding sites of the interleukin-8 gene. J. Virol. 71:5692. Moretta, A., S. Sivori, M. Vitale, D. Pende, L. Morelli, R. Augugliaro, C. Bottino, L. Moretta. 1995. Existence of both inhibitory (p58) and activatory (p50) receptors for HLA-C molecules in human natural killer cells. J. Exp. Med. 182:875. Biassoni, R., C. Cantoni, M. Falco, S. Verdiani, C. Bottino, M. Vitale, R. Conte, A. Poggi, A. Moretta, L. Moretta. 1996. The human leukocyte antigen (HLA)-C-specific “activatory” or “inhibitory” natural killer cell receptors display highly homologous extracellular domains but differ in their transmembrane and intracytoplasmic portions. J. Exp. Med. 183:645. Bottino, C., S. Sivori, M. Vitale, C. Cantoni, M. Falco, D. Pende, L. Morelli, R. Augugliaro, G. Semenzato, R. Biassoni, et al 1996. A novel surface molecule homologous to the p58/p50 family of receptors is selectively expressed on a subset of human natural killer cells and induces both triggering of cell functions and proliferation. Eur. J. Immunol. 26:1816. Pende, D., P. Rivera, S. Marcenaro, C. C. Chang, R. Biassoni, R. Conte, M. Kubin, D. Cosman, S. Ferrone, L. Moretta, A. Moretta. 2002. Major histocompatibility complex class I-related chain A and UL16-binding protein expression on tumor cell lines of different histotypes: analysis of tumor susceptibility to NKG2D-dependent natural killer cell cytotoxicity. Cancer Res. 62:6178. Moretta, A., R. Biassoni, C. Bottino, M. C. Mingari, L. Moretta. 2000. Natural cytotoxicity receptors that trigger human NK-cell-mediated cytolysis. Immunol. Today 21:228. Vitale, M., C. Bottino, S. Sivori, L. Sanseverino, R. Castriconi, E. Marcenaro, R. Augugliaro, L. Moretta, A. Moretta. 1998. NKp44, a novel triggering surface molecule specifically expressed by activated natural killer cells, is involved in non-major histocompatibility complex-restricted tumor cell lysis. J. Exp. Med. 187:2065. Diefenbach, A., D. H. Raulet. 2001. Strategies for target cell recognition by natural killer cells. Immunol. Rev. 181:170. Sutherland, C. L., N. J. Chalupny, D. Cosman. 2001. The UL16-binding proteins, a novel family of MHC class I-related ligands for NKG2D, activate natural killer cell functions. Immunol. Rev. 181:185. Salih, H. R., H. Antropius, F. Gieseke, S. Z. Lutz, L. Kanz, H. G. Rammensee, A. Steinle. 2003. Functional expression and release of ligands for the activating immunoreceptor NKG2D in leukemia. Blood 102:1389. Salih, H. R., H. Antropius, H. G. Rammensee, A. Steinle. 2002. Expression of MICA and MICB, ligands of the immunoreceptor NKG2D, on leukemia cells: cell surface release and triggering of anti-leukemia activity of cytotoxic lymphocytes. Blood 100:549a. Groh, V., R. Rhinehart, J. Randolph-Habecker, M. S. Topp, S. R. Riddell, T. Spies. 2001. Costimulation of CD8 αβ T cells by NKG2D via engagement by MIC induced on virus-infected cells. Nat. Immunol. 2:255. Morra, M., D. Howie, M. S. Grande, J. Sayos, N. Wang, C. Wu, P. Engel, C. Terhorst. 2001. X-linked lymphoproliferative disease: a progressive immunodeficiency. Annu. Rev. Immunol. 19:657. Parolini, S., C. Bottino, M. Falco, R. Augugliaro, S. Giliani, R. Franceschini, H. D. Ochs, H. Wolf, J. Y. Bonnefoy, R. Biassoni, et al 2000. X-linked lymphoproliferative disease: 2B4 molecules displaying inhibitory rather than activating function are responsible for the inability of natural killer cells to kill Epstein-Barr virus-infected cells. J. Exp. Med. 192:337. Latchman, Y., P. F. McKay, H. Reiser. 1998. Cutting edge: identification of the 2B4 molecule as a counter-receptor for CD48. J. Immunol. 161:5809. Brown, M. H., K. Boles, P. A. van der Merwe, V. Kumar, P. A. Mathew, A. N. Barclay. 1998. 2B4, the natural killer and T cell immunoglobulin superfamily surface protein, is a ligand for CD48. J. Exp. Med. 188:2083. Parronchi, P., M. De Carli, R. Manetti, C. Simonelli, S. Sampognaro, M. P. Piccinni, D. Macchia, E. Maggi, G. Del Prete, S. Romagnani. 1992. IL-4 and IFN (α and γ) exert opposite regulatory effects on the development of cytolytic potential by Th1 or Th2 human T cell clones. J. Immunol. 149:2977. Bradley, L. M., D. K. Dalton, M. Croft. 1996. A direct role for IFN-γ in regulation of Th1 cell development. J. Immunol. 157:1350. Coudert, J. D., C. Coureau, J. C. Guery. 2002. Preventing NK cell activation by donor dendritic cells enhances allospecific CD4 T cell priming and promotes Th type 2 responses to transplantation antigens. J. Immunol. 169:2979. Velardi, A., L. Ruggeri, A. Moretta, L. Moretta. 2002. NK cells: a lesson from mismatched hematopoietic transplantation. Trends Immunol. 23:438. Caligiuri, M. A., C. Murray, M. J. Robertson, E. Wang, K. Cochran, C. Cameron, P. Schow, M. E. Ross, T. R. Klumpp, R. J. Soiffer, et al 1993. Selective modulation of human natural killer cells in vivo after prolonged infusion of low dose recombinant interleukin 2. J. Clin. Invest. 91:123. Fehniger, T. A., E. M. Bluman, M. M. Porter, E. Mrozek, M. A. Cooper, J. B. VanDeusen, S. R. Frankel, W. Stock, M. A. Caligiuri. 2000. Potential mechanisms of human natural killer cell expansion in vivo during low-dose IL-2 therapy. J. Clin. Invest. 106:117. Ferlazzo, G., D. Thomas, S.-L. Lin, K. Goodman, B. Morandi, W. A. Muller, A. Moretta, C. Münz. 2003. The abundant NK cells in human secondary lymphoid tissues require activation to express killer cell Ig-like receptors and become cytolytic. J. Immunol. 172:1455. Jinushi, M., T. Takehara, T. Kanto, T. Tatsumi, V. Groh, T. Spies, T. Miyagi, T. Suzuki, Y. Sasaki, N. Hayashi. 2003. Critical role of MHC class I-related chain A and B expression on IFN-α-stimulated dendritic cells in NK cell activation: impairment in chronic hepatitis C virus infection. J. Immunol. 170:6249. Jinushi, M., T. Takehara, T. Tatsumi, T. Kanto, V. Groh, T. Spies, T. Suzuki, T. Miyagi, N. Hayashi. 2003. Autocrine/paracrine IL-15 that is required for type I IFN-mediated dendritic cell expression of MHC class I-related chain A and B is impaired in hepatitis C virus infection. J. Immunol. 171:5423.